Additional Info: Electric feature fire in lounge. 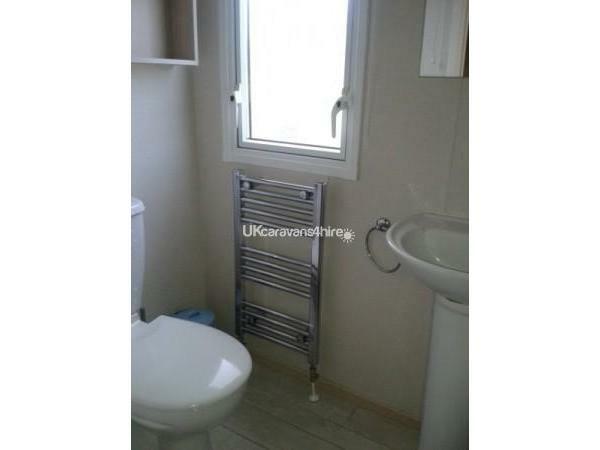 Additional WC en suite to master bedroom. Larger sized master bedroom with room for a cot. HIGH CHAIR and BED GUARD provided at no extra cost. Out door decking. 2nd TV in main bedroom. PS2 Games Console with a selection of games. 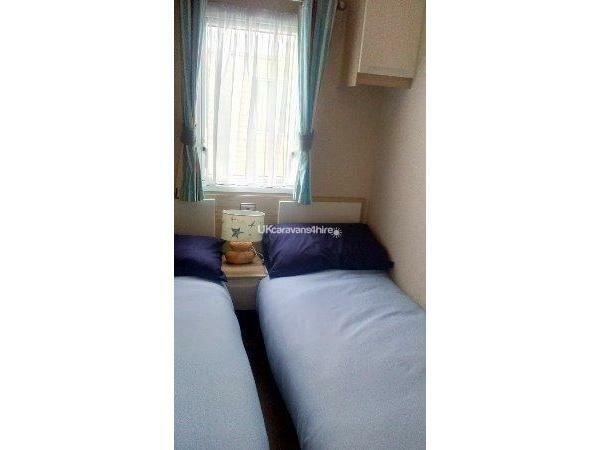 Fully equipped kitchen with Wok, and George Foreman Health Grill Sleeps 8 with pull out double bed in the lounge. £100 non refundable deposit is required to secure booking. A refundable security deposit of £100 is also required against damages . Further details on request. 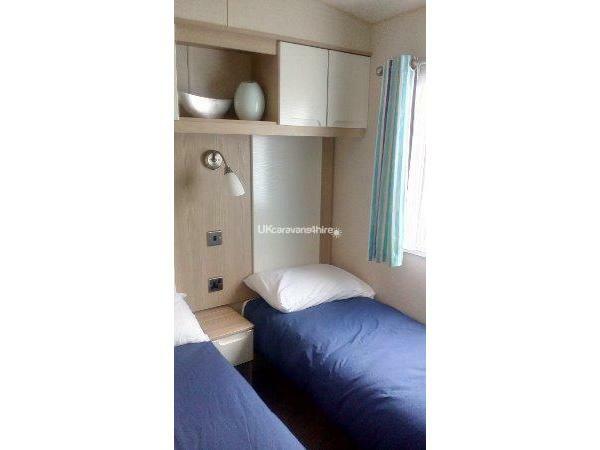 Sited in October 2016 .This is a beautifully presented, and very modern and well appointed 3 bedroom Abi Beachcomber, beach themed, caravan located conveniently just a short walk from the entertainment centre. The décor is modern & contemporary. 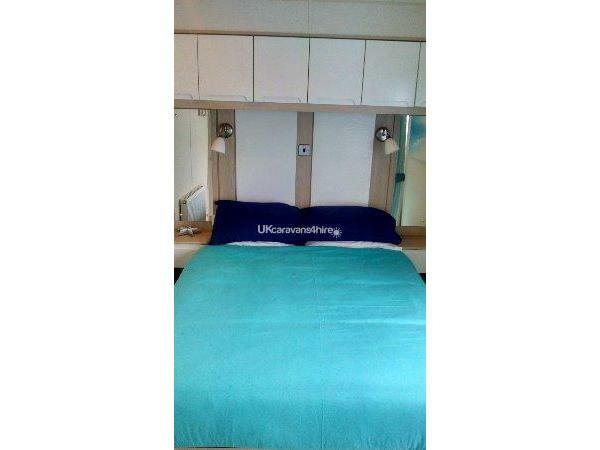 Having been newly sited in October 2016 with refurbished upholstery and brand new kitchen equipment and bedding. It is situated on a grassed area with a good sized decking with gate and ramp. The price listed is for the hire of the caravan only and passes to the pool and entertainment are not included and will need to be purchased on arrival. See bottom of the page for price details. Other facilities on offer such as go karts, crazy golf, - all available at an additional charge. There is an amusement arcade and the Mash & Barrel restaurant/Bar, a launderette, supermarket, Burger King and Papa Johns Pizza takeaway. The caravan is double glazed and has a spacious lounge area with a feature electric fire, a shower room with basin and toilet. For added security and peace of mind there is a alarm fitted to the caravan. There is also an additional separate ensuite WC with sink off the master bedroom. There is 1 double bedroom and 2 twin bedrooms (guests can push the single beds together to make a double if desired) & an additional fold out double bed in the lounge. The caravan can accommodate up to 8 people. It is equipped to a high standard and offers a 32" flat screen TV with DVD player and a selection of DVD's, radio/CD player with IPhone dock & jack lead. There is also a PS2 games console with a selection of games. The kitchen which has a full sized oven & hob & FULL sized fridge/freezer and, has been very well stocked with kettle, 4 slice toaster, George Foreman health grill, microwave and cafeteria. Various sized plates, glasses and serving dishes and a variety of cooking utensils are provided. Guests with younger children will also find a selection of plastic plates, bowls and tumblers a bed guard & high chair at no extra cost. 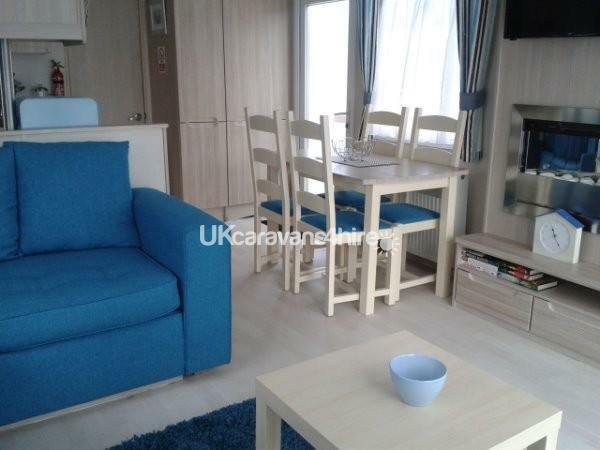 Outside you will find a good sized decking with patio set and a grassed area There is a small car park conveniently located at the rear of the caravan. Gas & electric is included in the price. The caravan is fitted with smoke and carbon monoxide alarms. Presthaven Holiday Park is located right next to a large sandy beach with direct access just a 4 minute walk from the caravan. The town of Prestatyn with shops, pubs and restaurants is a 5 minutes drive from the entrance of Presthaven. Pillows and quilts and bedding are all included are provided with beds made up with fresh bedding ready for guests arrival, Guest just need to bring their own, towels and tea towels. An additional £100 deposit will be required with all bookings against damages & breakages. This will be returned within 5 working days of inspection of the caravan provided all is in order but typically we are refunding within 48 hours. All lettings must include a responsible adult of at least 25yrs. Please Note. There is a strict no pets and no smoking policy at this caravan. Q. How much are the fun/entertainment passes? Off-peak up to 7 night stay £103 for up to 6 people & £132 for 8 people. 3 to 4 night stay-Peak holiday dates: up to 6 people £115 or £148 for up 8 people. up to 7 night stay-Peak holiday dates: : up to 6 people £142 or £183 for up to 8 people. Prices correct at time of this advert being placed. 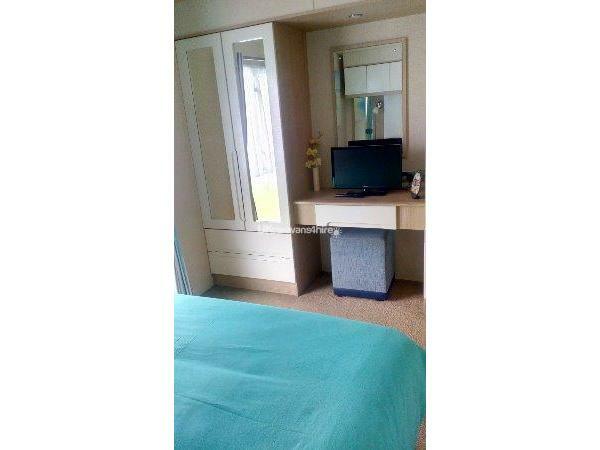 Q: Do occupants of the caravans have access to all the facilities on offer at Haven? Q: How long do I have to wait for the return of the security deposit ? A: After inspection of property and no issues found, we aim to return the deposits within 5 working bank days of departure but typically We are refunding within 48 hours. However we have no control over the time it takes the banks to process payments. Q. How close is the parking? A. There is a small car park conveniently located to the rear of the caravan. A. Yes customers can pay of the balance in smaller payments as and when they want to. Lovely caravan 5 star service from owner janet Highly recommend 5???????????????????? Thank you. Your custom is valued. Thank you for your lovely comments. Your welcome back any time and we will be working hard to maintain our high standards. Lovely caravan, very clean and well kept. The owner Janet is very helpful and nothing was too much trouble. The caravan is located well and close to the beach. We had a lovely time would recommend to friends and family and would definitely come back. Thank you so much for your lovely comments. We look forward to having you back sometime in the future ! Myself and my husband have stayed in this beautiful caravan.So clean and tidy the owner Janet has thought of everything you may need for your holiday.She was veey helpful before we went.The caravan is well sited just near enough to the facilities.I have started to recommend to my family and friends.Book this caravan and you wont be disappointed.We will certainly using the caravan again. Thank you for your kind comments. We love our caravan and we are glad you love it too! Just got back from a 4 night stay and had a brilliant time, caravan was very clean upon arrival and had everything needed and more. The owner (janet) was more than helpful before and after our stay. The caravan is close to all Facilities on site which is great especially with younger children. would defiantly recommend to family and friends.